It can become annoying having to click on windows or other "scrollable" areas within windows. Sometimes, you end up accidentally clicking on a file or some other object just so that you can use your mouse scroll wheel. I stumbled across a free, highly useful program called WizMouse that works in 32-bit and 64-bit versions of Windows 2000, XP, Vista, and 7 that solves this very problem. 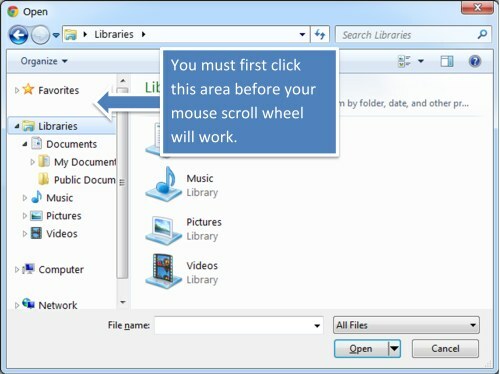 Until Microsoft builds a simple feature into Windows to enable mouse scrolling on mouse hover, give WizMouse a try.